A while back I discovered a great adjustable strap tutorial on a blog called "You sew, girl!". It was clearly written and has great photos so I was able to make an adjustable strap in no time. The blog is about the goings-on of the Nicole Mallalieu Design Studio based in Brunswick, in Melbourne, Australia. Nicole Mallalieu, an experienced fashion designer and bag maker, owns and operates the studio. 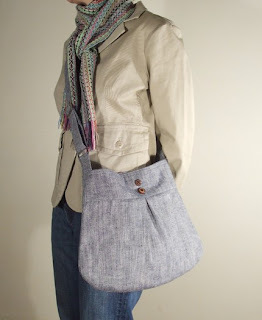 You can find lots of useful tips and tutorials about bag making on her blog. She also sells great bag making supplies, her own patterns and gives workshops. Check out the blog for inspiration and much more. Thanks Nicole for such a wonderful blog!